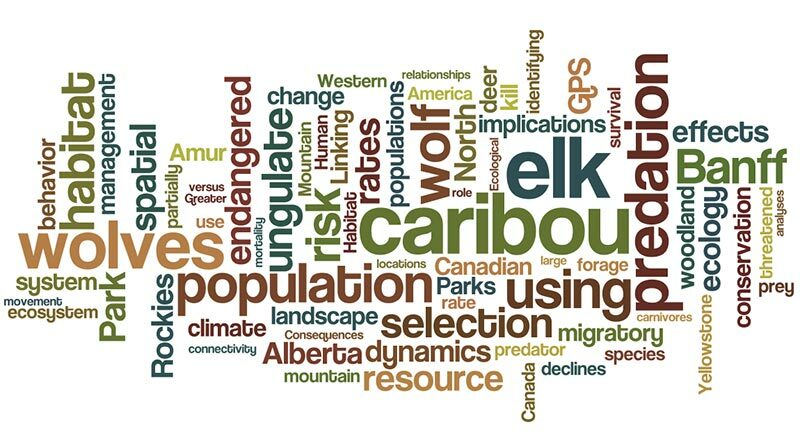 January 2019: Mark Hebblewhite is recruiting a new PhD student for Fall 2019 to work on the Ya Ha Tinda long-term elk project. Find out more here (.pdf). December 2018: Professor Mark Hebblewhite visited SciShow to discuss ungulates, predator-prey relationships and his latest research. Our research interests broadly lie in understanding 1) how wildlife such as ungulate herbivores balance the costs of predation with the benefits of foraging, and 2) how human activities influence this balance, and the ensuing conservation and management consequences to wildlife population dynamics. Ungulate habitat selection is a primary mechanism used to balance predation and forage, and our research uses new techniques to link the consequences of resource selection to population dynamics. Our research approach is largely empirical, based on field studies, and makes use of advances in spatial and statistical modeling including resource selection functions, cox-proportional hazards survival analyses, and landscape simulation models using GIS. Because human activities often influence predation risk and forage distribution, we believe it is crucial for research to have applied conservation and management components.